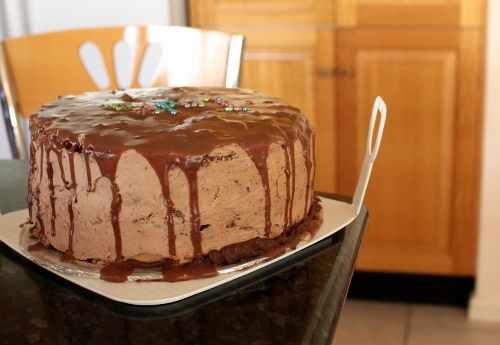 Chocolate Mud Cake | Vondelicious! 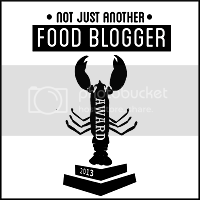 Do you know how your love of food/cooking/baking started? I do. It all started with cakes. From the moment I realised that it was possible to make cakes from scratch at home, I had to make one. It wasn’t easy, despite the simple (but not very reliable) recipe I used and it took at least 4 tries to get it right. But after the first time I got it right, I was hooked. I fell in love with the feeling of creaming butter, whipping eggs, folding the batter and then scraping it all out of the bowl and into the tins. And I loved the anticipation whilst watching to see if the cake would rise (and more importantly how much it would rise) and the satisfaction of taking a beautiful cake straight out of the oven to devour straight away. I’ll take any opportunity to bake a cake- which is why I did not hesitate to offer to bake a cake for my friend's surprise party. You can probably guess it didn’t quite go as planned. The baking, however, started off perfectly. The recipe was simple- just some melting of chocolate and butter, then some mixing and then into the oven it went. I did go a little overboard with the mixing (because it’s so fun!) so the cake turned out lighter than it should have been, and therefore not very mud cake-y, but I like light cakes anyway =] I don’t have two pans of the same size in my household, so I ended up baking then in two slightly different tins. The cakes turned out wonderful despite the slightly domed shape (I increased the temperature a bit). They smelt delicious and I had an urge to just peel of the crispy edges like I always do but somehow managed to refrain. It was so hard not knowing how the cake would taste! With the baking only taking me about an hour, I had things all under control- how long could the icing possibly take???? I left the cake to cool for more than an hour, which was more than enough, in this cool weather. Once I was satisfied that the cake was cool enough, I started with the frosting, which was a simple truffle ganache frosting- just chocolate, sugar, cream and butter. When that was done, I started to cut trim the cakes. Since one was larger than the other, I wanted to cut the larger one until it was the same size as the smaller one- sounds simple enough right? It was only then that I realised I’d never trimmed any cake before, and as I made my way around the cake with a knife, bits and pieces just fell off, leaving me with a smaller, wonky sized cake! From there on it went downhill- I tried to cut the top one too make it look like the second one, and when that didn’t work I tried cutting them both together- but the cake just fell off in huge pieces! 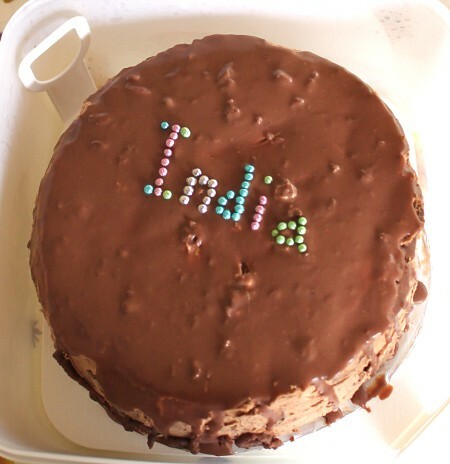 The originally 23cm cake, eventually turned into a smaller than 20cm cake, and I ended up having to stick the cake back together with chocolate……and ended up with a terrible chocolatey mess in my kitchen too! There were cake crumbs and chocolate everywhere! And then when I went on to frost the cake, I realised that I didn’t have nearly enough frosting- clearly 200mL of cream was not enough to frost two layers of 20cm cake! So I improvised a chocolate butter cream with melted chocolate, butter and icing sugar only to run out of chocolate (luckily I still had some not very good quality chocolate in my pantry) and to have the chocolate turn into specks of chocolate in the buttercream. So, more than two bars of chocolate, two blocks of butter (no one needed to know that…), a tub of cream and a two sink-fuls of baking equipment later, I finally had my cake. Now all that was left to do was to put it in the cardboard cake box and take it to school……. and ask the canteen ladies whether we could borrow their fridge for half a day, and try to sneak the cake into a room without the birthday girl seeing it =] The surprise party was a success, and we had a wonderful time, even if it took half of lunch to get everything prepared. Because of certain laws which ban students from taking knives to school, we had to cut the cake with a plastic knife- which just does not work, no matter how good at cutting cakes you are! The cake however, tasted surprisingly good- I got great reviews from everyone who tasted it (although no one's ever really going to tell you that your cake tastes bad) and it was definitely one of the best chocolate cake recipes I've tried- I'd definitely use it again! I'd probably halve the recipe next time- despite our very large group of friends, we found it difficult to finish it all! 1. Preheat oven to 160 degrees Celsius (not fan-forced). 2. Grease the side and base of a deep 23cm or 24cm diameter (inside top measurement) round cake pan. Line base and side of the pan with non-stick baking paper, extending the paper a few centimetres above the top rim of the pan. 5. Add the caster sugar to the bowl with the flour mixture, and stir the ingredients together until well combined. For this recipe, we prefer to use a whisk to stir ingredients together. 6. In a medium bowl, place eggs, oil, vanilla and buttermilk. 7. Whisk the wet ingredients together until well combined. 8. Add the egg mixture to the flour mixture and stir until well combined. 9. Add the chocolate mixture to the egg and flour mixture in a three batches, stirring until combined after each addition. 10. Pour mixture into prepared pan. 11. Bake for about 1 hour and 15 minutes (24cm pan) or 1 hour and 30 minutes (23cm pan). Insert a thin-bladed knife or wooden skewer into the centre of the cake to test whether it is cooked through. If the knife/skewer comes out clean or with moist crumbs (not gooey batter) attached, the cake is ready. If not, return the cake to the oven and bake for a further 5-10 minutes before testing again. 12. When cooked through, remove cake from oven, cover with a clean tea towel and allow to cool in the pan. Oh well done Von. So much effort. When I was in school and needed to take any food in, I just got my mum to make it for me ;P The cake looks very yummy and I wouldn't have known that you were having all that trouble. Oh, and I never buy baking chocolate, I wait for the weekly specials and stock up on chocolate, usually the 70% dark stuff. Although the downside is I tend to sample it a bit. Your cake looks terrific! You did a great job! 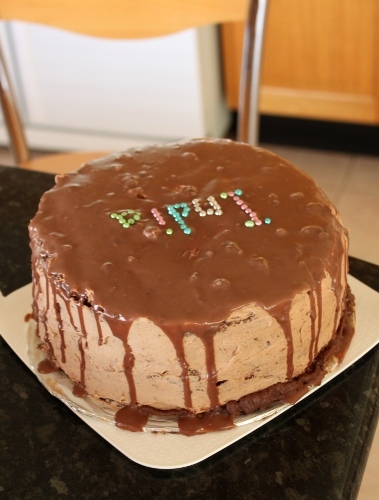 No matter what difficulties you had this cake looks so delicious that it must have been worth it in the end! I know exactly how you feel about baking cakes because I feel the same way! The smell of the cake baking and the first warm, sweet and fragrant bite never fails to make the whole baking process worthwhile! Lovely cake - and I think you did a very good job! Awww - I wish I had a friend like you!!! Your mud cake looks scrumptious and I would eat it in a heartbeat!! You're right, everyone loves chocolate. Looking at your cake, I would not have imagined that you had so much of difficulty! It really does look pretty appetising! This cake looks marvellous! And I am sure that India appreciated all of your hard work in getting it there. I found the same thing with cooking chocolate - I always just buy Old Gold, and only resort to cooking chocolate for white chocolate recipes (as Dream does not melt). WOW! This cake really huge, I think about 5" high. Good job. things may not have turned out exactly as you planned but it turned out great!! I can only imagine how good it tasted! 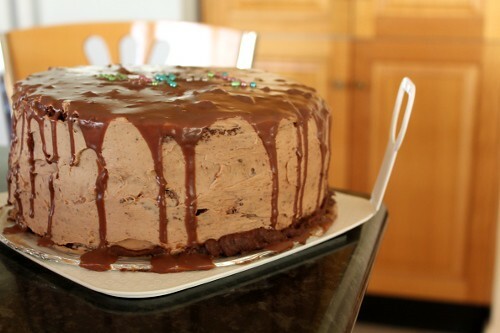 Mud cake! This is something I've been planning to make since awhile ago. Hopefully soon! Yours look pretty good. I wonder if I could just take a look at the texture of the cake. Enjoy & have a nice day! aww von, that cake is full of the good things in life. I would have made a mess of myself devouring it all! Awww, that is so sweet! :) And what a massive cake. I particularly like the ganache dripping over the sides. Bah! Who cares if cake is lopsided or uneven? Cake is cake :D You might want to try freezing the cake layers if you have time next time around, it helps keep the cake from breaking off in big old chunks. Hi Von, thanks for dropping by my blog and leaving the nice words! I could not tell the cake undergone such a huge "operation" :) But it was so fun to read how you did it and you did a great job! A girl who loves to cook and eat so much that she would probably be obese by now were it not for her awesome teenage metabolism!